NYC, 02/22/2019, 2:00PM. Molly's Game (2017): Owner Of The Poker Empire Becomes FBI Target. 140 min. Director: Aaron Sorkin. Starring Jessica Chastain, Idris Elba, Kevin Costner. 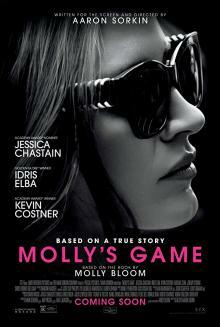 Molly's Game has an Academy Award nomination for Best Adapted Screenplay. It grossed $28.8 million in the United States and Canada, and $30.5 million in other territories, for a worldwide total of $59.3 million.